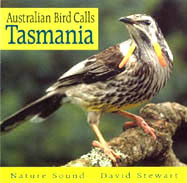 Tasmania has 12 endemic bird species: the Tasmanian Native-hen, Green Rosella, Forty-spotted Pardalote, Tasmanian Scrubwren, Scrubtit, Tasmanian Thornbill, Yellow Wattlebird, Yellow-throated Honeyeater, Strong-billed Honeyeater, Black-headed Honeyeater, Dusky Robin and Black Currawong. The CD features a range of calls for this unique group, along with those of a further 68 species, many of whose calls are different to their mainland cousins and particular attention has been paid to this aspect. Where possible, a range of calls of each species is presented, allowing the listener to become aware of the repertoire of sounds possessed by many of the birds, particularly songbirds. Ron Nagorcka, well known Tasmanian naturalist and composer, has supported this presentation by making a considerable number of calls available to make the selection more comprehensive. The album features no music or spoken commentary. The natural calls of Tasmania's birds can be appreciated both as a source of pleasant sounds, or as a well documented reference source of many of the island's bird species, particularly those that are difficult to observe. A list of the species, with call description and behaviour notes, can be found inside the cover. For those people with a particular interest in any of the calls, further information can be obtained from the author. 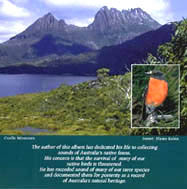 Birds Australia, the largest bird organisation in the country, endorses and recommends this CD to anybody interested in enjoying and knowing the calls of many of Tasmania's wonderful birds.